A doctor who retraced the voyage of Captain Bligh, cast adrift following the infamous Mutiny on the Bounty, is the latest guest speaker to sign up for Expo 2017. 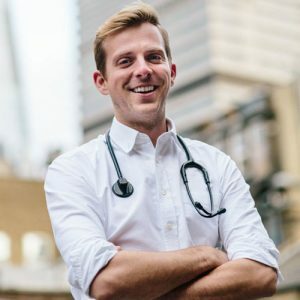 Dr Luke Kane, a trainee GP in London, became famous earlier this year after appearing in the Channel 4 documentary “Mutiny” in which a crew of nine braved the treacherous waters of the Pacific Ocean to retrace Bligh’s gruelling journey of 1789. Under the watchful eye of their captain, Anthony Middleton, chief instructor on SAS: Who Dares Wins, their mission was to see if a modern-day crew could survive the voyage of 3,500 nautical miles, completed by Bligh and 18 loyal sailors who were cast adrift in a launch following the mutiny led by Fletcher Christian. Luke, 33, was the boat’s doctor and braved malnutrition, dehydration and huge storms to treat serious infections and wounds among the crew. Luke, who also volunteered to treat people with Ebola in Sierra Leone as part of the NHS response to the epidemic, will lead a session titled “Doctors of the World”, in our theatre space. He explained that during their voyage he dealt with the slow deterioration in people’s conditions, with sleep deprivation and stress causing hallucinations. Luke himself lost the most weight – 25kgs – as the crew battled with the mental pressures of the voyage, dealing with the doubt and despondency created by starvation, exposure and the perils of the open ocean. Luke will be speaking on day two of Expo 2017, the annual flagship NHS event that attracts speakers and delegates from across the health, local government and social care sectors. Among a host of leading speakers will be NHS England Chief Executive Simon Stevens, Health Secretary Jeremy Hunt, the Chief Nursing Officer for England Professor Jane Cummings, and NHS England’s National Medical Director Professor Sir Bruce Keogh. The overarching theme for the event is ‘Collaboration to implement the NHS Five Year Forward View across health and social care’. As well as the two main ‘Future NHS’ and ‘Innovate’ stages, and four smaller theatre stages, there will be four feature zones focussing on the key areas of Transformation of Care, Urgent and Emergency Care, Primary Care and Digital Health. Our theatre stages will offer longer, more in-depth exploration of key topics, with dedicated sessions for leaders, commissioners, clinicians and communications leads. The four feature zones, dominating the conference hall, are an important and unique element of Expo. Feature zones are spaces dedicated to in-depth, varied discussion, learning and engagement focused around a single area of health and social care work. Each zone runs its own programme of speakers and activities throughout the two days. The ever-popular Pop-Up University features again this year and will showcase the very best in innovative care, treatment and commissioning from across the NHS, local government and social care, as well as giving in-depth information on the latest developments in individual areas of the health and care sector. Workshops are led by some of the most senior and experienced professionals in England. There is now less than four weeks to sign up for the event of September 11 and 12 – the fourth of its kind at the iconic Manchester Central venue. All NHS, local government and public sector staff can register for complimentary tickets on the Expo website – make sure you add the link as that page gives details of how to claim complimentary tickets.